It’s a long walk to the Centre of New Zealand. Most of it up. I can’t tell you exactly how much up at this point, since the only contour map I’ve got at the moment is not of a scale that shows that particular hill. Our day of leisure started off with a visit to the Miyusa Japanese Garden. Miyusa and Nelson are sister cities, and the garden is a joint project. The dedication plaque marks 1976 as the year of dedication. It may seem quite odd to travel halfway around the world to visit a Japanese garden in another country. So be it; Herself and I are both fond of Japanese gardens for many reasons, shared and separate. The day’s weather forecast indicated fair skies all day, however, by half-past noon clouds moved in. We left the Miyusa Garden and headed back into town, following a different road than the route out. Our destination this time, Founder’s Park, something of an historical park about early Nelson days. This is a bit loosely defined, since there in we also found a number of things rather newer than early Nelson. Vintage cars, an airplane, little things like that. Still, kept our interest for a bit. Turning right leaving Founder’s Park took us to the Nelson Botanic Garden, wherein is located the geographic centre of New Zealand. Exiting the car, we found no signs (other than the one by the road which caught our attention) indicating where the monument is located. However, we climbed a nearby track under the supposition that it might lead to the point. Trig B.H. 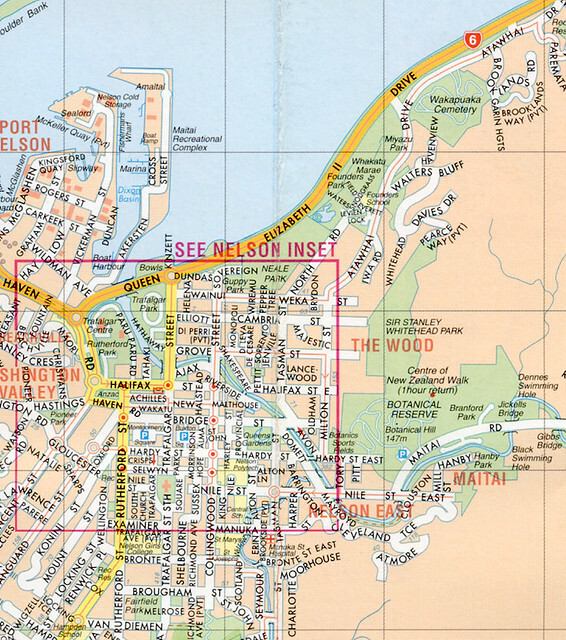 is the point of origin for surveys in the Nelson District. We also found a spectacular view of the city and surrounds. Hopefully, the panoramic series I made will come out well. Coming down the hill took significantly less time. Back to the hotel for a brief rest, and then we set out to see a bit of the city. The bit we set out to see is the Nelson Cathedral. Rather an interesting structure, hardly a traditional cathedral, it is something of an Art-Deco style and design. We’ve now seen three cathedral’s in New Zealand; one in Christchurch, St. Paul’s in Dunedin, and the Nelson Cathedral. During the stroll I stopped into two camera stores looking for more film. Specifically, I wanted to find more Fuji Provia, the color transparency film I’ve been shooting rather more than less. The first shop dealt only with Kodak, so though they had film, I deferred purchasing any. However, the clerk (nice young gent name of A) wanted to know what my camera was, and when I told him a Mamiya C330 he perked up a bit. Hadn’t ever seen one, and rather wanted to. Unfortunately for him, I’d left the Old Man back in the hotel. The second shop carried Fuji film, but not 120 mm. Likewise in the third shop. However, while the proprietor was able to answer my question quickly, he referred me to a young lady standing there. She works at a fourth shop, which I’d somehow managed to walk right past without noticing, and she said she believed they had some Provia. Then we chatted back and forth a bit about medium format cameras and how nice they are. Other than Chch, I've probably scanned the photographs from Nelson the most. That is, curiously enough, because I also got a commission for a retirement gift which would involve a triptych from the Japanese Garden. And yet, still I need to finish scanning the film from NZ. Not to mention all the film from before NZ. And most of it from after. This entry was originally posted at http://madshutterbug.dreamwidth.org/127201.html. Please comment there using OpenID. I never got to Nelson. I headed south from Picton and missed the North West coast. Whereas we never got to North Island at all, other than the International Airport in Auckland. I spent 2 week in North Island followed by 2 weeks in South Island. It was rather good.